So far, I’ve dealt with Donald Trump’s bid for the White House as performance art: a clever, full-body, self-marketing scheme in the fashion of actor Joaquin Phoenix restyling himself as a hip-hop artist to promote his mockumentary I’m Still Here. You remember that odd media moment from a few years back, right? When the handsome star of the Johnny Cash biopic Walk the Line grew a huge beard and rapped incoherently on David Letterman? I can’t be the only one, can I? Still, after all these months—can it truly be nearly a year and not an eon or two?—I guess I finally have to accept that he’s really running for president and I have to figure out how to explain Donald Trump to my kids. At 9, 3, and 2, they may be the only Americans left who aren’t in the know when it comes to The Donald—and, believe me, I have no illusions. This is going to be tough! After all, he makes me scream at the screen, which leads my kids to wonder not about him but about their mom. It goes without saying (which is undoubtedly why I’m saying it) that he’s the antithesis of everything I believe in. Why are you not surprised by this? I’m way left of Bernie Sanders. I don’t usually admit it in public, but I’m probably going to vote for Green Party presidential candidate Jill Stein. She talks about deep system change and a human-centered economy, and that’s the kind of talk I like. So, it’s no surprise that Donald Trump pushes all my buttons, even a few I hadn’t noticed that I had, which is why I’ve tried to relegate him to the National Enquirer end of the media-political spectrum. But now that the Enquirer is breaking stories of “political import” in the era of The Donald and he’s even more of a household name than ever, it’s time to reconcile with reality. It’s time to accept that, even though (or do I mean because?) he’s racist and sexist, blustering and entitled, full of lies and blames and hates, he’s a Republican presidential candidate of consequence. I know, I know—I’m the last person in the United States to do this, but bear with me. And even if he doesn’t win (please, God, yes! ), who can deny that this election says something sad, troubling, and important, if not—in the Trumpian tradition—unbearably self-important, about our country? I imagine a President Trump and I immediately want to move my whole family to the other side of his big, fat, future “beautiful” wall on the border with Mexico. All of this means that maybe trying to explain the Donald Phenomenon to my kids is a lost cause from the start. I’ll just get screechy and irrational and 9-year-old Rosena will go into preteen mode and roll her eyes, while 3-year-old Seamus will say: “Mom, why are you pullin’ on your hair and cryin’?” As I’m reading about Trump, however—and like all Americans these days, to read is to Trump and to view is to Trump, so I’m totally Trumped—I’ve been thinking lately that maybe I have the whole thing upside down. It’s not that I should teach my kids about him, but that my kids could teach him a thing or two about how to be a good person. They could make him great again! 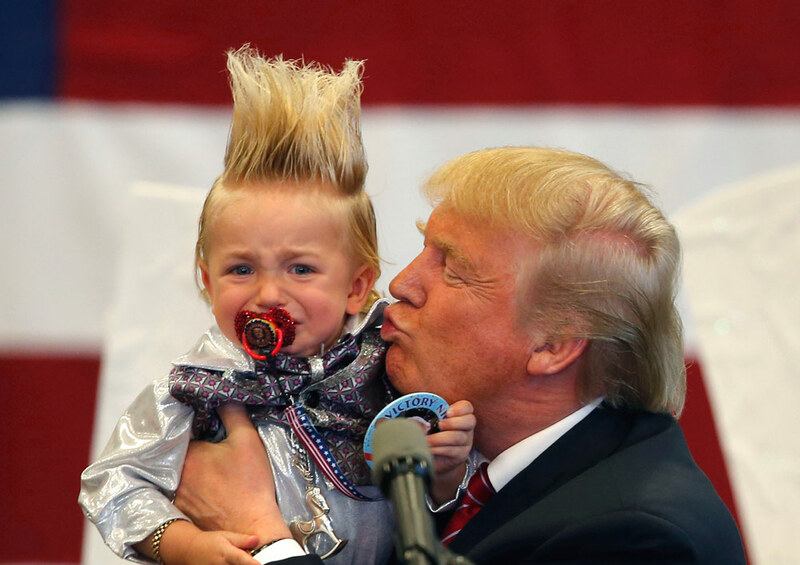 Maybe what we need to do is take Donald Trump back to Toddler Town. “Mine, Madeline! It’s mine.” The kids are both pulling on Olaf’s arms. The tiny, hug-loving snowman from Frozen is stretched between them, and Seamus is technically correct: Olaf was a Christmas present from his big sister Rosena. I am, however, trying to teach them the concept of “ours” and sharing and taking turns as well. If it isn’t something they can share—like books—they can at least trade off, so that both Seamus and his younger sister have a chance to enjoy the object of affection exclusively for a few minutes. The objects in our house—except for the high-tech, expensive, and dangerous ones (which are mine)—belong to all of us and should be used and enjoyed responsibly by all of us. That’s how we officially operate. My mother, an activist in her own right, always told my brother, sister, and me that “mine is a chilling word.” Isn’t that a great line? I don’t use it a lot, because the kids get sidetracked by whatchilling means. It’s no surprise that they are only partway there in moments that really matter like that dispute over Olaf, but Seamus is savvy enough to recognize that deploying the word “ours” when Madeline (the house baby at 2) says “mine” is a good way of getting my attention and some kind of interventionary help against his little sister. Madeline just learned the word “everybody’s,” as in, “This ball is everybody’s.” It’s mighty cute, even if it does sometimes still stand in for “mine.” And we keep trying. I love watching my kids on the playground and work hard not to helicopter in or—the opposite effect that adds up to more or less the same thing—disappear into my phone or the crossword puzzle. And what amazes me is that they’re so outgoing and ready to connect with anyone who comes along. Kids are scared of all sorts of things. Seamus and Madeline are afraid of the dark, of monsters, of superheroes gone bad, and—most of all—kale salad. (Their big sister Rosena harbors this particular dread, too.) Their fears are, of course, largely imaginary (kale salad aside). So try explaining the very real terror pressing at the heart of the Republican Party establishment now that their punishing no-government-is-good-government credo (except when it comes to our giant military and the most oppressive powers of the national security state, those giant tax breaks for the rich, and those giant prisons for the poor, black, and brown) has taken root in the ultimate anti-candidate, the bad boy with the world’s most talked about hairdo (the blonde bouffant with its own Twitter handle— “I’m on top of the man who is on top of the world. Follow me, people”).